"SOFIA" redirects here. For other uses, see Sofia (disambiguation). SOFIA with the telescope door open in flight. The Stratospheric Observatory for Infrared Astronomy (SOFIA) is an 80/20 joint project of NASA and the German Aerospace Center (DLR) to construct and maintain an airborne observatory. NASA awarded the contract for the development of the aircraft, operation of the observatory and management of the American part of the project to the Universities Space Research Association (USRA) in 1996. The DSI (Deutsches SOFIA Institut) manages the German parts of the project which are primarily science and telescope related. SOFIA's telescope saw first light on May 26, 2010. SOFIA is the successor to the Kuiper Airborne Observatory. It will observe celestial magnetic fields, star-forming regions, comets, nebulae, and the galactic centre. SOFIA is based on a Boeing 747SP wide-body aircraft that has been modified to include a large door in the aft fuselage that can be opened in flight to allow a 2.5 m (8.2 ft) diameter reflecting telescope access to the sky. This telescope is designed for infrared astronomy observations in the stratosphere at altitudes of about 12 kilometres (41,000 ft). SOFIA's flight capability allows it to rise above almost all of the water vapor in the Earth's atmosphere, which blocks some infrared wavelengths from reaching the ground. At the aircraft's cruising altitude, 85% of the full infrared range will be available. The aircraft can also travel to almost any point on the Earth's surface, allowing observation from the northern and southern hemispheres. Once ready for use, observing flights were expected to be flown three or four nights a week. Originally scheduled to be operational for 20 years, in its tentative budget for the fiscal year 2015 NASA announced that unless Germany's aerospace center would contribute significantly more than previously agreed upon, the observatory would be grounded by 2015. [needs update] The SOFIA Observatory is based at NASA's Armstrong Flight Research Center at Palmdale Regional Airport, California, while the SOFIA Science Center is based in Ames Research Center, in Mountain View, California. The NASA logo reflected in SOFIAs 2.5-meter primary mirror. SOFIA uses a 2.5 m (8.2 ft) reflector telescope, which has an oversized, 2.7 m (8.9 ft) diameter primary mirror, as is common with most large infrared telescopes. The optical system uses a Cassegrain reflector design with a parabolic primary mirror and a remotely configurable hyperbolic secondary. In order to fit the telescope into the fuselage, the primary is shaped to an f-number as low as 1.3, while the resulting optical layout has an f-number of 19.7. A flat, tertiary, dichroic mirror is used to deflect the infrared part of the beam to the Nasmyth focus where it can be analyzed. An optical mirror located behind the tertiary mirror is used for a camera guidance system. 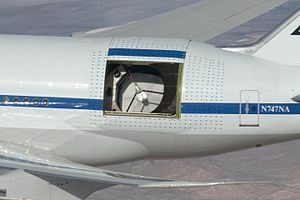 The telescope looks out of a large door in the port side of the fuselage near the airplane's tail, and initially carried nine instruments for infrared astronomy at wavelengths from 1–655 micrometres (μm) and high-speed optical astronomy at wavelengths from 0.3–1.1 μm. The main instruments are the FLITECAM, a near infrared camera covering 1–5 μm; FORCAST, covering the mid-infrared range of 5–40 μm, and HAWC, which spans the far infrared in the range 42–210 μm. The other four instruments include an optical photometer and infrared spectrometers with various spectral ranges. SOFIA's telescope is by far the largest ever to be placed in an aircraft. For each mission one interchangeable science instrument will be attached to the telescope. Two groups of general purpose instruments are available. In addition, an investigator can also design and build a special purpose instrument. On April 17, 2012, two upgrades to HAWC were selected by NASA to increase the field of view with new transition edge sensor bolometer detector arrays and to add the capability of measuring the polarization of dust emission from celestial sources. The open cavity housing the telescope will be exposed to high-speed turbulent winds. In addition, the vibrations and motions of the aircraft introduce observing difficulties. The telescope was designed to be very lightweight, with a honeycomb shape milled into the back of the mirror and polymer composite material used for the telescope assembly. The mount includes a system of bearings in pressurized oil to isolate the instrument from vibration. Tracking is achieved through a system of gyroscopes, high speed cameras, and magnetic torque motors to compensate for motion, including vibrations from airflow and the aircraft engines. The telescope cabin must be cooled prior to aircraft takeoff to ensure the telescope matches the external temperature to prevent thermally-induced shape changes. Prior to landing the compartment is flooded with nitrogen gas to prevent condensation of moisture on the chilled optics and instruments. DLR is responsible for the entire telescope assembly and design along with two of the nine scientific instruments used with the telescope, NASA is responsible for the aircraft. The manufacturing of the telescope was subcontracted to European industry. The telescope is German-made; the primary mirror was cast by Schott AG in Mainz, Germany with lightweight improvements, with grinding and polishing completed by the French company SAGEM-REOSC. The secondary silicon carbide based mirror mechanism was manufactured by the Swiss Center for Electronics and Microtechnology (CSEM). A reflective surface was applied to the mirror at a facility in Louisiana but the consortium now maintains a mirror coating facility in Moffett Field, allowing for fast recoating of the primary mirror, a process that is expected to be required 1–2 times per year. The SOFIA aircraft pictured during a test flight in 1998. Still mostly in United Airlines livery, a black square has been painted on the aft fuselage to indicate the location of the door that will be opened in flight to allow the telescope access to the sky. The SOFIA aircraft is a modified Boeing 747SP widebody (serial number 21441, line number 306; registration N747NA; callsign NASA747) with a distinguished history. Boeing developed the SP or "Special Performance" version of the 747 for ultra long range flights, modifying the design of the 747-100 by removing sections of the fuselage and heavily modifying others to reduce weight, thus allowing the 747SP to fly higher, faster and farther non-stop than any other 747 model of the time. Boeing assigned serial number 21441 (line number 306) to the airframe that would eventually become SOFIA. The first flight of this aircraft was on April 25, 1977 and Boeing delivered the aircraft to Pan American World Airways on May 6, 1977. The aircraft received its first aircraft registration, N536PA and Pan American placed the aircraft into commercial passenger service. Shortly thereafter, Pan Am named this aircraft in honor of the famous aviator Charles Lindbergh. At the invitation of Pan Am, Lindbergh's widow, Anne, christened the aircraft Clipper Lindbergh on May 20, 1977, the 50th anniversary of the beginning of her husband's historic flight from New York to Paris in 1927. United Airlines purchased the plane on February 13, 1986 and the aircraft received a new aircraft registration, N145UA. The aircraft remained in service until December, 1995, when United Airlines placed the aircraft in storage near Las Vegas. On April 30, 1997, the Universities Space Research Association (USRA) purchased the aircraft for use as an airborne observatory. On October 27, 1997 NASA purchased the aircraft from the USRA. NASA conducted a series of "baseline" flight tests that year, prior to any heavy modification of the aircraft by E-Systems (later Raytheon Intelligence and Information Systems then L-3 Communications Integrated Systems of Waco, Texas). To ensure successful modification, Raytheon purchased a section from another 747SP, registration number N141UA, to use as a full-size mock-up. Commencing work in 1998, Raytheon designed and installed a 5.5 m (18 ft) tall (arc length) by 4.1 m (13.5 ft) wide door in the aft left side of the aircraft's fuselage that can be opened in-flight to give the telescope access to the sky. The telescope is mounted in the aft end of the fuselage behind a pressurized bulkhead. The telescope's focal point is located at a science instruments suite in the pressurized, center section of the fuselage, requiring part of the telescope to pass through the pressure bulkhead. In the center of the aircraft is the mission control and science operations section, while the forward section hosts the education and public outreach area. The open fuselage has no significant influence on the aerodynamics and flight qualities of the airplane. At NASA's invitation, Lindbergh's grandson, Erik Lindbergh, re-christened the aircraft as Clipper Lindbergh, on May 21, 2007, the 80th anniversary of the completion of Charles Lindbergh's trans-Atlantic flight. During 2012 the plane received a glass cockpit upgrade along with new avionics systems. The first use of an aircraft for performing infrared observations was in 1965 when Gerard P. Kuiper used the NASA Convair 990 to study Venus. Three years later, Frank Low used the Ames Learjet for observations of Jupiter and nebulae. In 1969, planning began for mounting a 910 mm (36 in) telescope on an airborne platform. The goal was to perform astronomy from the stratosphere, where there was a much lower optical depth from water-vapor-absorbed infrared radiation. This project, named the Kuiper Airborne Observatory, was dedicated on May 21, 1975. The telescope was instrumental in numerous scientific studies, including the discovery of the ring system around the planet Uranus. The proposal for a larger aircraft-mounted telescope was officially presented in 1984 and called for a Boeing 747 to carry a three-meter telescope. The preliminary system concept was published in 1987 in a Red Book. It was agreed that Germany would contribute 20% of the total cost and provide the telescope. However, the reunification of Germany and budget cuts at NASA led to a five-year slide in the project. NASA then contracted the work out to the Universities Space Research Association (USRA), and in 1996, NASA and the German Aerospace Center (DLR) signed a memorandum of understanding to build and operate SOFIA. The SOFIA telescope's primary mirror is 2.5 meters in diameter and was manufactured of Zerodur, a glass-ceramic composite produced by Schott AG that has almost zero thermal expansion. REOSC, the optical department of the SAGEM Group in France, reduced the weight by milling honeycomb-shaped pockets out of the back. They finished polishing the mirror on December 14, 1999, achieving an accuracy of 8.5 nanometres (nm) over the optical surface. The hyperbola-shaped secondary mirror was made of silicon carbide, with polishing completed by May 2000. During 2002, the main components of the telescope were assembled in Augsburg, Germany. These consisted of the primary mirror assembly, the main optical support and the suspension assembly. After successful integration tests were made to check the system, the components were shipped to Waco, Texas on board an Airbus Beluga aircraft. They arrived on September 4, 2002. SOFIA completed its first ground-based "on-sky" test on August 18–19, 2004 by taking an image of the star Polaris. The project was further delayed in 2001 when three subcontractors tasked with development of the telescope door went out of business in succession. United Airlines also entered bankruptcy protection and withdrew from the project as operator of the aircraft. The telescope was transported from Germany to the United States where it was installed in the airframe in 2004 and initial observations were made from the ground. In February 2006, after cost increases from $185 million to $330 million, NASA placed the project "under review" and suspended funding by removing the project from its budget. On June 15, 2006, SOFIA passed the review when NASA concluded that there were no insurmountable technical or programmatic challenges to the continued development of SOFIA. The maiden flight of SOFIA took place on April 26, 2007 at the L-3 Integrated Systems' (L-3 IS) Waco, Texas facility. After a brief test program in Waco to partially expand the flight envelope and perform post-maintenance checks, the aircraft was moved on May 31, 2007 to NASA's Armstrong Flight Research Center at Edwards Air Force Base. The first phase of loads and flight testing was used to check the aircraft characteristics with the external telescope cavity door closed. This phase was successfully completed by January, 2008 at NASA- Armstrong Flight Research Center. On December 18, 2009, the SOFIA aircraft performed the first test flight in which the telescope door was fully opened. This phase lasted for two minutes of the 79-minute flight. SOFIA's telescope saw first light on May 26, 2010, returning images showing M82's core and heat from Jupiter's formation escaping through its cloud cover. Initial "routine" science observation flights began in December 2010 and the observatory is slated for full capability by 2014 with about 100 flights per year. Illustration of SOFIA livery with door in open and closed position. An F/A-18 mission support aircraft shadows SOFIA during a functional check flight. SOFIA during telescope characterization testing. SOFIA sat on the tarmac during night-time telescope operations. KAO and SOFIA, Ames Research Center 2008. Model of SOFIA at NASA Ames Exploration Center. The primary science objectives of SOFIA are to study the composition of planetary atmospheres and surfaces; to investigate the structure, evolution and composition of comets; to determine the physics and chemistry of the interstellar medium; and to explore the formation of stars and other stellar objects. While SOFIA aircraft operations are managed by NASA Dryden, NASA's Ames Research Center in Mountain View, California, is home to the SOFIA Science Center which will manage mission planning for the program. On 29 June 2015, the dwarf planet Pluto passed between a distant star and the Earth producing a shadow on the Earth near New Zealand that allowed SOFIA to study the atmosphere of Pluto. In early 2016, SOFIA detected atomic oxygen in the Atmosphere of Mars for the first time in 40 years. In early 2017, its observations of 1 Ceres in the mid-infrared helped determine the large asteroid/dwarf planet was coated with a layer of asteroid dust from other bodies. In July 2017, SOFIA observed a star occultation of the distant asteroid 2014 MU69 while ground based observatories failed this observation, preparing the probe New Horizons visiting this asteroid. SOFIA was designed from the beginning to support a robust public education and outreach effort that can, during the planned 20-year mission lifetime, directly involve more than a thousand educators of all types — K-12 teachers, science museum and planetarium educators, and public outreach specialists — as partners with the scientist, and reach hundreds of thousands of people across the nation through these educators. The "SOFIA Six" are the first set of educators selected in United States to participate in SOFIA's AAA "Pilot" program, and flew during the summer of 2011. Germany has a separate application process, but also flew two teachers that summer. Educator teams plus alternates were selected in a highly competitive application process. NASA and DLR (German Space Agency) selected educators came from a variety of backgrounds, and their institutions included a school for the deaf, an alternative education site (developmentally challenged), highly underserved student populations, rural schools, and a Native American school. Since the "Pilot" cycle the AAA program has flown over 20 teams and is now in its Cycle 5 phase. Star Trek actress Nichelle Nichols flew aboard SOFIA on September 17, 2015. ^ "SOFIA Science Center". Universities Space Research Association. Retrieved 25 December 2016. ^ "8 - 1 NASA FY 2015 Budget Request for Science" (pdf). ^ Elizabeth Howell (4 March 2014). "BUDGET 2015: Flying SOFIA Telescope To Be Shelved For 'Higher-Priority' Programs Like Cassini". Universe Today. ^ "NASA Budget Would Begin Work on New Science Missions, Ground SOFIA". ^ Malakoff, David (4 March 2014). "Major U.S. Science Agencies Face Flat Prospects". Science Magazine News. Retrieved 2014-03-05. ^ Malacara, Daniel; Thompson, Brian J. (2001). Handbook of Optical Engineering. CRC Press. p. 246. ISBN 0-8247-9960-7. ^ a b c Krabbe, Alfred (March 2007). "SOFIA telescope". Proceedings of SPIE: Astronomical Telescopes and Instrumentation. Munich, Germany: SPIE — The International Society for Optical Engineering. pp. 276–281. arXiv:astro-ph/0004253. Bibcode:2000SPIE.4014..276K. doi:10.1117/12.389103. ^ Krabbe, Alfred; Casey, Sean C. (July 2002). "First Light SOFIA Instruments". Proceedings, SPIE conference on Infrared Spaceborne remote Sensing X. Seattle, USA: Dordrecht, D. Reidel Publishing Co. arXiv:astro-ph/0207417. Bibcode:2002astro.ph..7417K. ^ "NASA – NASA Selects Science Instrument Upgrade for Flying Observatory". ^ a b c d Keller, Luke; Jurgen Wolf (October 2010). "NASA's New Airborne Observatory". Sky and Telescope: 22–28. ^ "New Facility to Improve Airborne Telescope's Clarity". NASA. ^ a b "N747NA". Retrieved 1 August 2013. ^ "N747NA". Retrieved 1 August 2013. ^ a b "News and Updates". Archived from the original on 2012-04-03. ^ "The Boeing 747 Classics". boeing.com. The Boeing Co. Archived from the original on 2010-12-03. Retrieved 2009-01-23. Boeing also built the 747-100SP (special performance), which had a shortened fuselage and was designed to fly higher, faster and farther non-stop than any 747 model of its time. ^ Beall, Ace (2015-12-08). "Omega Tau Podcast Episode 190 – SOFIA Part 2, The Flights" (Interview). Interviewed by Markus Völter. Omega Tau Podcast. ^ Hautaluoma, Grey; Hagenauer, Beth (2007-05-11). "NASA's SOFIA to be Rededicated on Historic Lindbergh Anniversary". National Aeronautics and Space Administration. Archived from the original on 2010-12-03. Retrieved 2008-07-23. ^ Erickson, E. F.; Davidson, J. A. (July 1994). "SOFIA: The future of airborne astronomy". Proceedings of the Airborne Astronomy Symposium on the Galactic Ecosystem: From Gas to Stars to Dust. Mountain View, CA: Astronomical Society of the Pacific. pp. 707–773. Bibcode:1976IAUS...73...75P. ^ Mewhinney, Mike (2005-05-24). "Kuiper Airborne Observatory Marks 30th Anniversary of its Dedication". NASA. Retrieved 2008-07-04. ^ Titz, Ruth; Roeser, Hans-Peter (1998). SOFIA : astronomy and technology in the 21st century. Berlin: Wissenschaft und Technik. arXiv:astro-ph/9908345. Bibcode:1999RvMA...12..107K. ISBN 3-89685-558-1. ^ Staff (14 December 1999). "REOSC Delivers the Best Astronomical Mirror in the World to ESO". European Southern Observatory. Archived from the original on 14 October 2007. Retrieved 23 July 2008. ^ Casey, Sean C. (2004). "The SOFIA program: astronomers return to the stratosphere". Advances in Space Research. 34 (3): 77–115. Bibcode:2004AdSpR..34..560C. doi:10.1016/j.asr.2003.05.026. ^ Mewhinney, Michael (9 September 2004). 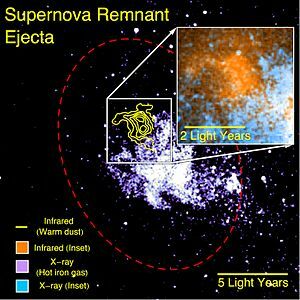 "NASA Airborne Observatory Sees Stars For First Time". SOFIA Science Center. Archived from the original on 12 October 2006. Retrieved 23 July 2003. ^ McKee, Maggie (13 February 2006). "NASA leaves jumbo-jet telescope on the runway". NewScientist.com. ^ Martin, Lance; Backman, Dana (2007-04-26). "SOFIA Airborne Observatory Completes First Test Flight". SOFIA Science Center. Archived from the original on 2008-11-22. Retrieved 2008-07-23. ^ a b Hautaluoma, Grey; Hagenauer, Beth (2008-01-16). "SOFIA Completes Closed-Door Test Flights". NASA. Retrieved 2008-07-23. ^ "SOFIA Sees Jupiter's Ancient Heat". DNews. ^ Bell, Kassandra (6 May 2016). "Flying Observatory Detects Atomic Oxygen in Martian Atmosphere". NASA. Retrieved 26 April 2018. ^ Veronico, Nicholas A. (19 January 2016). "Don't Judge an Asteroid by its Cover: Mid-infrared Data from SOFIA Shows Ceres' True Composition". NASA. Retrieved 26 April 2018. ^ a b "Airborne Astronomy Ambassadors". Archived from the original on 2014-03-27. ^ "News and Updates". Archived from the original on 2012-08-05. ^ "SOFIA Science Newsletter". SOFIA Science Center. April 2017. Retrieved 26 April 2018. ^ Howell, Elizabeth (6 August 2016). "Nichelle Nichols, Star Trek's 'Uhura,' Will Fly on NASA's SOFIA Observatory". Space.com. Retrieved 26 April 2018. 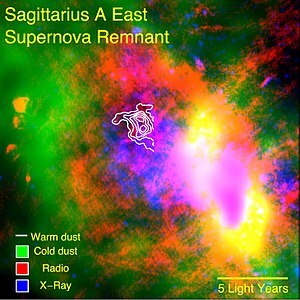 Wikimedia Commons has media related to Stratospheric Observatory for Infrared Astronomy. This page was last edited on 20 April 2019, at 21:41 (UTC).